April is an exciting month for Tennis fans as the clay courts return with The Monte Carlo Masters and Barcelona Open. Bet on any Tennis Matches between 15th & 28th April. 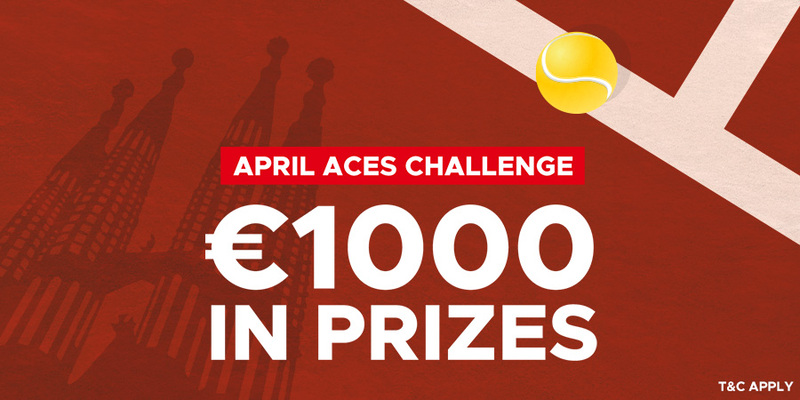 Earn points, climb the Leaderboard and win from our €1000 Prize Pool. Freebets money, Bonus money and Cash Out are not available toward this promotion. Examples : If I place a €10 multiple bet with total odds of 2.15, I will receive 30 points (10 x 3 points). If I place a €5 single bet with odds of 1.90, I will receive 10 points (5 x 2 points). earn points, climb the leaderboard and win from the prize pool! 1. The following Terms and Conditions should be read in conjunction with the General Terms and Conditions and the Bonus Terms and Conditions . 2. The promotion is valid on Betclic from 00.00 GMT on Monday 15th April 2019 until 23.59 GMT on Sunday 28th April 2019. 3. Players must opt-in to take part in the promotion. 4. An Eligible Bet must be a live or pre-live, single or multiple bet on any market of any sports between 15th April and 28th April. All Eligible bets must have a minimum odds of 1.80 and a minimum stake of €1. 5. Customers receive points in accordance with the qualifying bets made (“Points”). Scores will be converted into Euro currency and then into Points. If the qualifying bet is a single bet, each 1 euro which is staked will earn 2 Points. Accordingly, the higher the stake, the higher the customer’s score will be. If the qualifying bet is a multiple bet, each 1 euro which is staked will earn 3 Points. A single bet of €10 at odds of 1.5 placed will earn the player 20 points. A multiple bet of €10 at total odds of 1.9 placed will earn the player 30 points. A single bet of €6 at odds of 1.2 will not earn the player any points. 6. Only settled Eligible Bets placed with real money count towards this promotion. Duplicate bets, voided bets, system bets, fully or partially Cashed Out Bets as well as bets placed with bonus money or Freebets will not be accepted as Eligible Bets. 7. All participating players will be ranked on an daily, automatically updated leaderboard. The leaderboard will be displayed on the promotion page throughout the promotion. The leaderboard showing the final scores will be displayed on the landing page, at the end of the promotion. 8. Prizes will be paid on the 29th April. 9. For more information on Freebets, please visit What is a Freebet?. 10. Only players from the following countries are eligible for the Promotion: Germany, Hungary & UK. 11. Players from countries not listed in clause 10 are prohibited from claiming the Promotion Prizes. 12. By participating in the competition, the winners authorise Betclic and without compensation, to use their first name, first initial of their surname OR username, and their town/city of residence in all promotional materials, PR, and any publication on any Betclic websites, so that Betclic can publicise current or future promotions. 13. In case of conflict or discrepancy between the English language version of these terms and conditions and the translated versions in all other languages, the English language version shall prevail. 14. Betclic is in no way associated with any of the competitions mentioned above.